Tiny chocolate does me no favours! Well that news really took me by surprise! I just got home from my 8:15pm appointment at the hospital, and was given the results from Monday's glucose screening test, and full blood test. It turns out that my glucose levels were higher than "normal". Normal is below 7.8, and I scored 8.6, so I need to go back for a 2.5hr Glucose Tolerance Test (GTT) next week. I'm stunned because I eat so well! I told the nurse that my only vice has been that I've been eating about 3-4 tiny milk chocolate Easter eggs a day in the past few weeks. Some days I only have 1, other days I might have 4... could this be what's tipping my sugar levels high? Wtf? I don't drink soft drink or juice, I don't eat lollies, I never add sugar to my decaf coffee or cereal. It might be just a freak result, so I'm getting a second chance to take a more detailed test and hopefully it won't put me in a category of 'gestational diabetes'. I asked the nurse what it would mean if I scored high again, and she said that I wouldn't be able to go through the midwives program any more, I'd have to see a specialist Doctor (don't even ask me how we could afford that) for the remainder of my pregnancy and would need to do a finger prick test 3 times a day and monitor my insulin levels. She said that they would induce me at no later than 40 weeks because babies with gestational diabetes may either be very small, or very large. By now, I'm sitting there thinking information overload!!! But I calmed myself down by telling myself that it hasn't got to that point yet, I still have a second chance to "pass the test". It also turns out that my iron levels have dropped since the last test in January, so I need to eat more red meat, and other iron rich foods (or just add an iron supplement to my morning pre-natal vitamin). The nurse explained that since I was a runner before I got pregnant, this can affect my iron stores over time. She told me a couple of websites to look at for more information on iron in pregnancy, as well as gestational diabetes. I eat 4 Wheetbix with strawberries and banana and a glass of milk for breakfast. I'm the only one in my office who takes a packed lunch every.Single.Day. I load it up with fruit, fresh whole grain rolls with salmon and salad on them. Some days I take yogurt, other days it's extra fruit or nuts. I always make sure that I have enough fruit to snack on mid-morning and mid-afternoon. We cook dinner every night at home, and it always contains either salad or vegetables. I eat steak about twice a week, chicken twice a week, salmon fillets 1-2 times a week and pasta or risotto once a week. The only bad thing is those tiny Easter eggs! And the chocolate intake is pretty minimal (even if I have 4 in one day, it's still way less than a Mars bar, for example). I took my Midwife student (Miss A) along to this appointment, as Chop was working. SO I was really glad to have an extra set of ears to help me digest all of this unexpected information. In the car after the appointment, the student explained more about possible causes for the low iron and high insulin. Pregnancy really does put so many different pressures on the body, most of which I didn't really consider. I've been treating this pregnancy with an open mind, and not worrying myself with potential problems at all. I decided long ago that I would only ever deal with information as it was presented to me, and applied to me specifically (ie never going down the "what if" path and torturing myself with worry). Looks like I'll need to do a bit of reading up on these subjects and get a bit smarter about what I eat. The rest of the appointment was Ok. I had my belly measured, and the growth is spot on for this stage of the pregnancy, the baby's heart beat was 150bpm. He was putting no quite a show when she was checking my belly - lots of wriggling and kicking. The nurse thought he was lying kind of sideways with his head down near my pelvis. It made sense to me because he keeps kicking out under my right rib tonight. Miss A has offered to come along to my 2nd glucose test next week to keep me company for the 2.5 - 3 hours of sitting around. It helps her clock up her hours for her midwifery course, and it also keeps me company. I'm pretty annoyed that I'll need to take half a day off work to do this test, as I've got meetings booked in most mornings next week. But it's got to be done. And the next check-up is in 3 weeks time. So the frequency of appointments has stepped up a notch now that I've hit the third trimester. The nurse said I've potentially got about 7 more visits with the midwives between now and giving birth. Every 3 weeks, then weekly (after 36 weeks). In between this I've also got the glucose tolerance test, the 32 week ultrasound to see if the placenta has risen up, as well as 4 more antenatal classes. That's a lot of hospital visits!! In other news, my close friend had a baby boy on Monday. I rang her today and will hopefully go and see her on Friday when she gets out of the hospital. She had a 27 hour labour which all went smoothly. I was crying with joy and excitement for her by the time I got off the phone. She said that whenever she turns her head, she quickly whips it back to look at her baby because she can't believe how amazing and cute he is, and how much she loves him. So sweet. Now I better go... 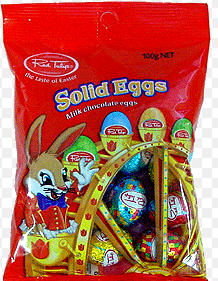 I have to imagine an Easter long weekend without consuming chocolate. What a crappy time of the year to have to undergo this particular test! BOOOOOOO. My bet is that you pass the next test. A lot of people fail the first and pass the longer one. But either way, don't beat yourself up about it. It is not your fault. A few Easter chocolates doesn't cause gestational diabetes :) Good luck! I have a friend who is skinny as a rail and eats fairly healthy, and massively failed the long GD test with both pregnancies. They said it's her pancreas not her diet (well, not diet alone) that is causing the GD. Just some food for thought, I hope you pass! I doubt your results are due to anything you've done. I know of women who ate very healthy and exercised daily, yet they still wound up with GD. It seems like it can be a pretty random thing. It stinks that you have to go through the long test. I hope everything comes back normal from that one. I can't say from experience, but will say following so many blogs that this failed test is very common. 98% of those woman went on to pass the 2 hour test with flying colors. Hoping you pass because I know how important you birth plan is. FIngers crossed for you. All of you girls are amazing! Thanks for the comments, encouragement and support. It's good to hear that this is totally normal to fail that first test.